Homemade German Chocolate Cake is a yummy recipe to make the German chocolate cake, coconut pecan filling, and chocolate ganache from scratch. German chocolate cake has been one of my favorite cakes for as long as I can remember. However, I’m not a fan of the mix version. There are some mixes that are pretty good – like angel food cake mixes. I haven’t had any German chocolate cake mixes that were very good, so if I’m going to have one, it’s got to be homemade. 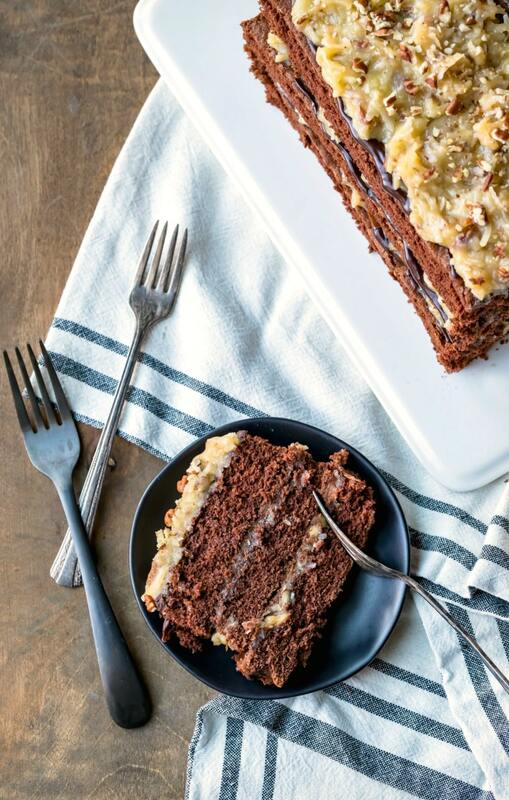 This homemade German chocolate cake recipe looks like there’s a lot to it. It really isn’t as bad as it looks, though, because I tried to break everything down as much as possible. This method for making homemade German chocolate cake is an easy way to make a layer cake without having to use multiple pans. If you happen to cut one layer a little larger than the others, use that layer as the bottom layer of the cake. Don’t skip lining the pan with parchment paper. It makes removing the cake so much easier. Can I use a different type of oil? I use coconut oil because the flavor works well with the cake, and coconut oil helps to make cakes fluffy. If you would like to use a different type of oil, a neutral oil, like vegetable oil, should be fine. Can I use soured milk? Yes, soured milk (milk + vinegar or lemon juice) will work just fine in place of the buttermilk. 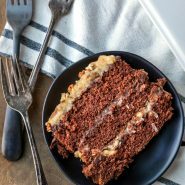 If you’ve tried this homemade German chocolate cake recipe, don’t forget to rate the recipe and leave me a comment below. I love to hear from people who’ve made my recipes! You can SUBSCRIBE to receive my latest recipe newsletters or FOLLOW ME on FACEBOOK, INSTAGRAM and PINTEREST for even more delicious food. 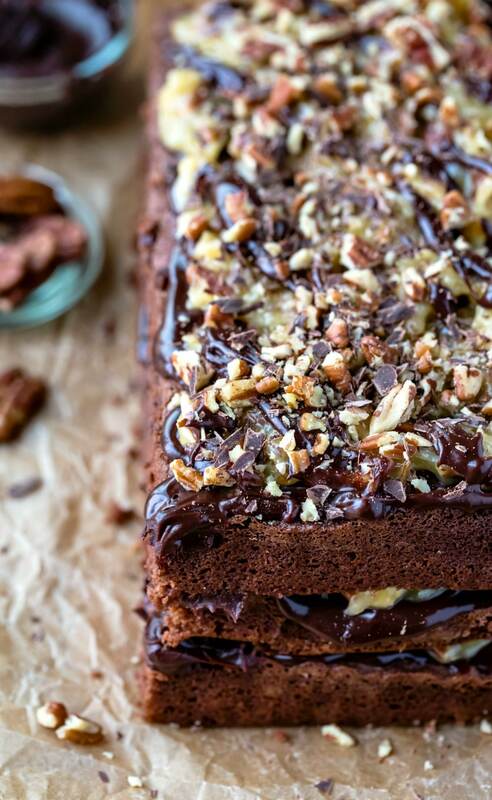 Easy three-layer German chocolate cake. To make the cake, preheat oven 350 F. Grease a 9x13-inch baking pan, and then line with parchment paper. Grease parchment paper; set aside. Place chocolate and cocoa powder in small, heatproof bowl. Pour boiling water over the chocolate and cocoa powder; stir until smooth. Beat coconut oil and sugars on medium-high until light and fluffy, about 3-4 minutes. Beat in the egg yolks, one at a time, until just incorporated. Reduce speed to low, and beat in chocolate mixture and vanilla. Stir in half of the flour mixture, the buttermilk, and then the other half of the flour mixture, stirring in each until just combined. In a separate bowl, beat egg whites on high until they form stiff peaks, about 4-5 minutes. Gently fold in beaten egg whites. Bake about 20-30 minutes, or until cake springs back when lightly pressed and a toothpick inserted in the center comes out clean. To make the coconut pecan topping, combine cream, cornstarch, sugar, egg yolks, and butter. Make sure that the cornstarch is fully incorporated before you begin cooking the mixture. Cook over medium heat, stirring occasionally, until it begins to thicken and bubble, about 10 minutes. Cook, whisking the entire time, for 2 minutes more. Be sure to keep whisking because it can easily scorch at this point. Fold in vanilla, coconut, and pecans, and then cool until thickened, about 30 minutes. 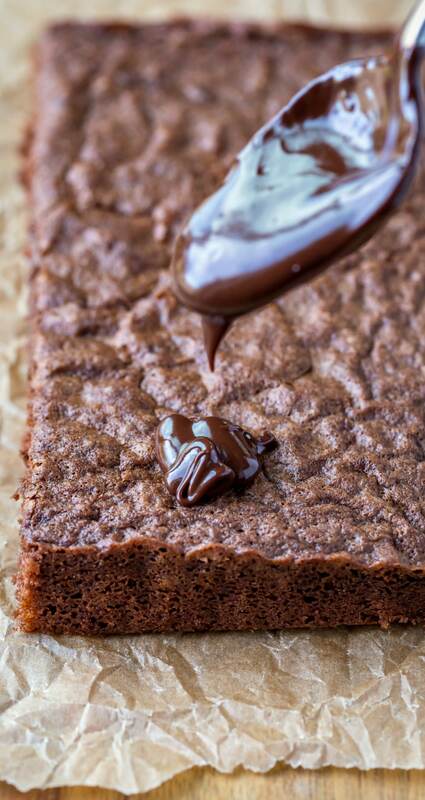 To make the ganache, place chocolate in a heat-proof bowl. Bring cream to a simmer in a small saucepan. Pour cream over chocolate, and let it sit, covered, for 5 minutes without stirring. Uncover, and whisk until melted and smooth. To put it all together, lift cake out of the pan. 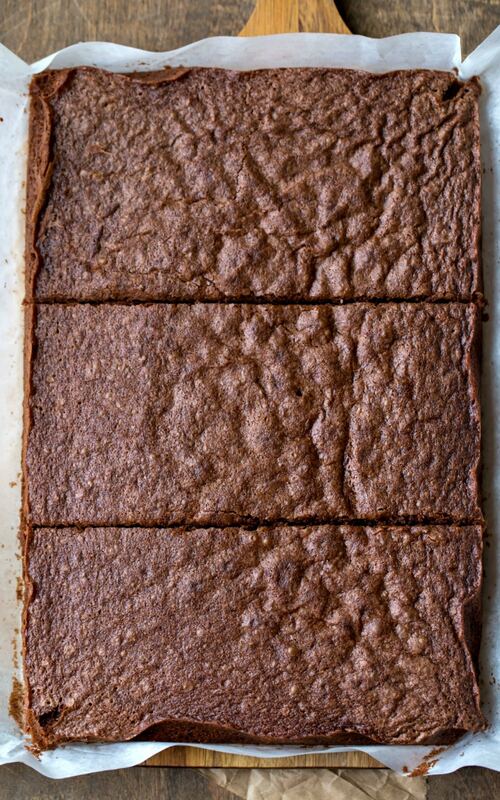 Using a serrated knife, slice cake horizontally into 3 equal-sized rectangles about 4 1/2x9-inches each. Coat the first layer of cake with 1/3 of the ganache, then cover evenly with 1/3 of the coconut pecan filling. Repeat with remaining cake layers, ganache, and filling. Leave sides of cake naked. Let cake set for 1-2 hours before slicing. Cover, and refrigerate any leftover cake. Adapted from The Sprinkles Baking Book. I want to make this recipe into cupcakes, so how long do I put them in the oven for. I haven’t tried to make this recipe into cupcakes to say for sure, but for a cake this size, it’s usually about 18-25 minutes. Hope that helps! I wish i had a Great cake that i could make. That don’t cost 48.00 for a cake. I have many cake recipes that don’t cost $48 to make. What kind of cake are you looking for? I don’t have any German sweet chocolate. Can I use something else? I have to make this cake tonight and don’t want to go to the store if I don’t have to. I’m excited to see how this tastes compared to the recipe on the German sweet chocolate box. By far the best German chocolate cake I’ve ever had! I made it for a family birthday. I had to fight for a small piece! I’m making another cake just for me today. Can you use gluten free baking or cake flour? So good! I made this for a family birthday party, it was gone immediately. Next time I’ll have to make two cakes. Wonderful cake! 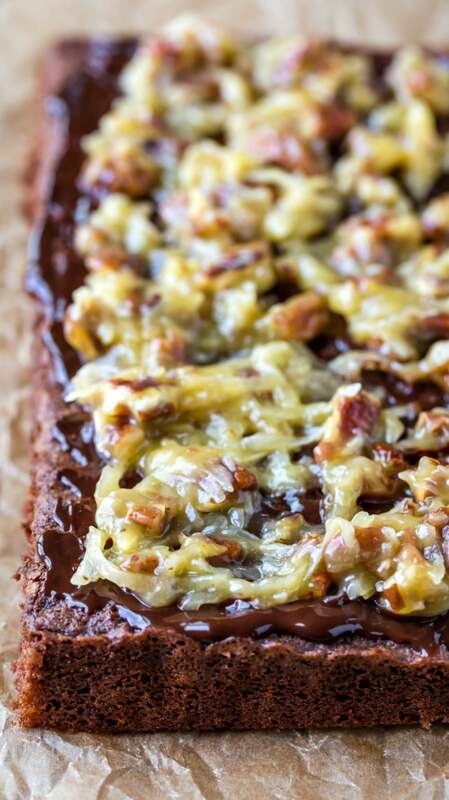 German chocolate cake is a favorite of mine and this recipe didn’t disappoint! The cake was moist and it was easy to make. Thank you for the great recipe! 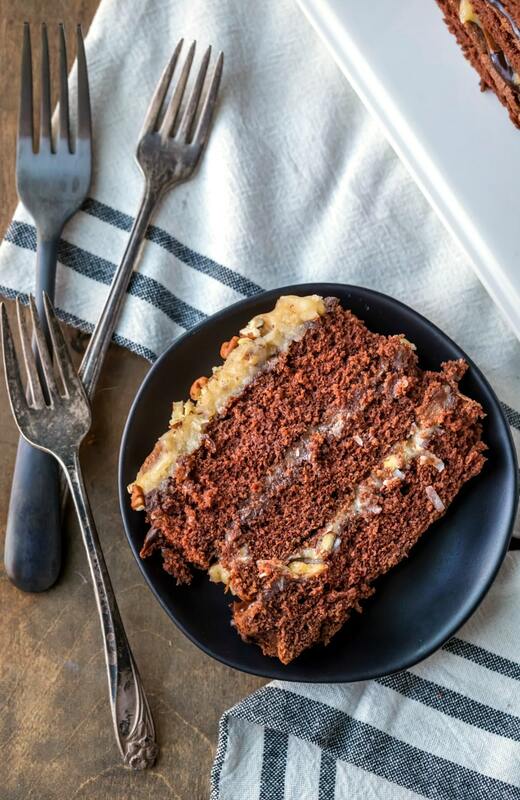 Can you make this German Chocolate cake in a 8 or 9 inch pan instead of the 9×13? You could probably divide the recipe in half and make it in an 8×8 pan, and I think you would end up with a two layer cake if you made it that way. Good luck! Yes! This was the best German chocolate cake. Thank you for this fabulous recipe! Wow. Simply amazing! Fabulous recipe.